Back in August, Bloomberg reported that Apple will launch a 12.2-inch iPad in early 2015, citing anonymous sources familiar with the matter. Since then, the reports and leaks of the device have been scarce. 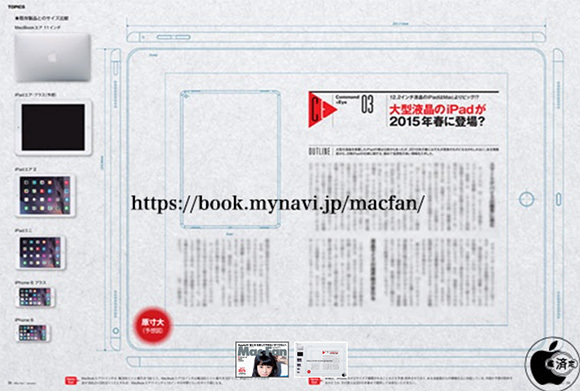 However, this weekend, a leak from the Japanese magazine Mac Fan reveals what they believe to be schematics and specs surrounding Apple’s rumoured tablet, which is now supposedly bigger with a display at 12.9 inches. 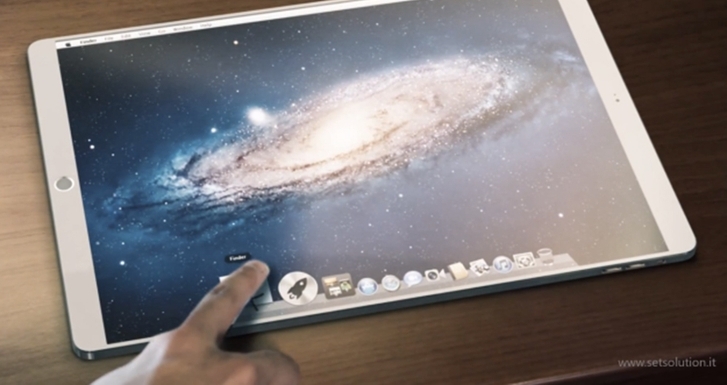 The company is expected to jump size significantly from the 9.7-inch iPad Air, that’s currently available. It is believed that the move is the outcome of the recent sluggish iPad sales. Purported measures of the previously rumoured device are 305.31×220.8×7 mm (12×8.7x.28 inches). The slate is said to feature Apple’s next generation A9 processor. The launch of bigger iPad makes sense as the company is opting for ‘bigger the better’ mantra for their other devices too like iPhone 6. The rumoured iPad is not the only monster slate in the market as Samsung launched 12.2-inch Samsung Galaxy Tab Pro earlier in February. AppleInsider has cited another Japanese publication called Macotakara that has some details which align with the information shared by Mac Fan. Macotakara said that the upcoming ‘iPad Air Plus’ will feature a 12.2-inch display with speakers and microphones on multiple edges. Macotakara also claimed that the iPad Air Plus won’t be as thin as the 6.1 mm iPad Air 2, but will be as slim as an iPhone, measuring somewhere between 6.9 mm and 7.1 mm. The same report by Mac Fan also added that the iPad mini 4 will be powered by Apple’s existing A8X processor and sport a new, thinner design. It also says that following the launch of the iPad mini 4, the iPad mini and iPad mini 3 will be discontinued. If these rumours are true, what we don’t understand is what will happen to the Apple MacBook Air family if a 12.2-inch iPad launches. Well, maybe the company will merge the MacBook Air and Pro lineup to make more space for the iPad Air Plus in the market. However, this may result in utter confusion and may cost Apple another setback in the iPad sales. Anyhow, these are just the production of rumour mill for now, the plan of the company will be revealed when the time comes. Until then, we wait.